By now it is clear that my husband and I are animal lovers, so naturally when the fall of 2008 rolled in with a serious acorn blight of some kind, our thoughts turned immediately to the hungry squirrels. Our house has a sliding glass door in the kitchen that leads out to what would be a lovely deck, if we’d ever gotten around to building it. When faced with the scariest acorn shortage ever, Dan got it into his head that we needed a deck. 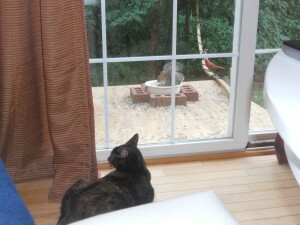 But not just any deck—we needed a squirrel deck. The next thing I knew, Dan had a big square piece of plywood laid out on the grass under the kitchen door. He started putting out food for the squirrels on the plywood. A few days later, he elevated the plywood 6” or so, and also added a spinning thing from which he could hang two ears of corn, for a little variety. Every few days, he would raise the plywood higher and higher, trying to acclimate the squirrels to their new food source. Finally, when the squirrels were completely comfortable with the arrangement, Dan put the plywood on a couple of posts and raised the squirrel deck flush with the bottom of our kitchen door. In between rolling my eyes and making sarcastic remarks, I started to notice how really cool it was to have a squirrel deck. 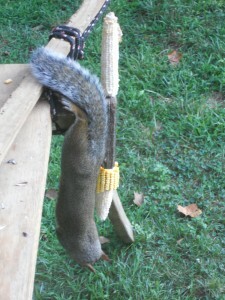 Dan bought nuts in bulk and ordered corn cobs by the case from www.crittercorn.com (Don’t believe me? Click on the link), and soon we had all kinds of woodland creatures dining in style right outside our door. Cardinals, blue birds, and squirrels in the morning, and an adorable family of raccoons late at night. Soon the deer started swinging by for a nibble, and inevitably, the red foxes meandered out as well. The foxes can’t climb up the deck, so at first we paid them little attention. But we finally realized that a fox is, well, crazy like a fox, and had taken to just hanging out under the deck. What goes up must come down, and some of the squirrels came down to a nasty surprise. Dan headed out to the hardware store again and brought home several pieces of lumber, and some heavy duty bungee cord. In a flash, Dan built a bridge from the deck to a tree in our backyard. It wasn’t pretty, but our precious squirrels had safe passage. By the time summer rolled around and food was plentiful, I couldn’t bear to give up the deck, and so it has stayed, in various iterations, for 4 years. Every morning Dan hitches up his pants and announces in his best Farmer Brown voice that he’s “goin’ out to feed the critters,” and the cats and I enjoy watching another morning of squirrel antics. Here’s a picture of the deck and bridge in all its glory (yes, that’s Helen in the foreground), and a picture of a particularly acrobatic squirrel enjoying the critter corn. Pretty fancy, eh? I love you and Dan for your treatment of the animals! Me too–although the pool in your backyard is not shabby.